I love when you get something free from something free, I'll tell you what I mean. I got a $5 Starbucks gift card in the mail from my credit card company (I guess they were feeling generous) anyway I was shopping at Safeway and they have a Starbucks in the store so I treated myself to a coffe and used my gift card to pay, when I got my receipt the cashier told me to go online and fill out a survey and bring my receipt back for a free tall drink of my choice. I love it! 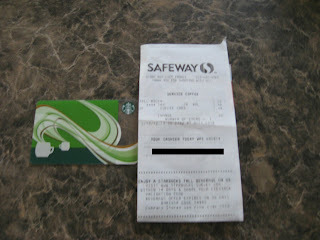 So FYI not sure if it's all the Safeways but if you buy a Starbuck's you might get a free drink.